Gems from Nebraska have either formed in place right here or they have been transported into the state by streams draining mountainous areas to the west or by glaciers that originated in the north. These diverse sources give Nebraska some unusual gemstones that provide the collector and lapidary with some interesting materials as well as opportunities to learn about the geology of the state. 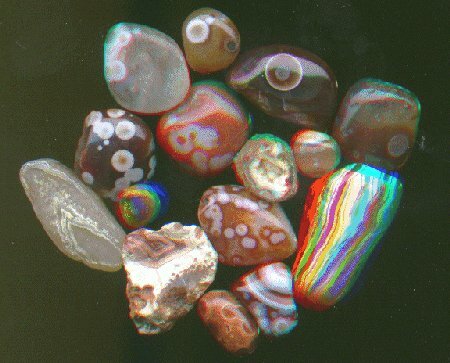 Lake Superior Eye Agates, from Glacial Deposits, Southeastern Nebraska. A collection of 97 images of gems and related information including location of discovery and description. A collection of notes about the traditional birthstones.